The Niti Ayog, the government’s premier think tank, recently unveiled a plan called First Play which lays down a strategy for getting India 50 medals in the 2024 Olympics. For a country that won just two medals in 2016, and a grand total of 23 medals over the last 70 years, this goal seems to be a real stretch. What makes this goal sheer delusion, however, is the plan they have come up with to get there. The Niti Ayog is run by bureaucrats. The CEO is a career bureaucrat as are many on its staff. They are bright people and I am sure they mean well for the country. But they are programmed to find solutions that run through the government machinery. 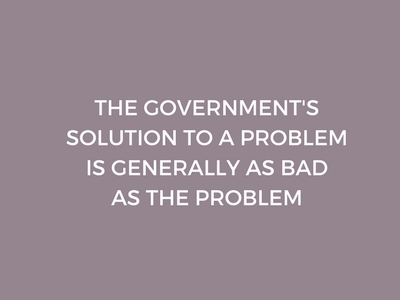 More government involvement, more policies, more regulations, and more committees are their solution for all problem. It is baffling that an institute tasked with transforming India would ignore the inexorable truth that market-based solutions that allow individuals to pursue goals based on their own set of skills and incentives are the best way to achieve optimum performance. Let’s examine NITI Ayog’s grand plan to increase India’s medal tally from 2 to 50 ( a 2500 percent increase) in less than eight years. Their first policy prescription is to target ten priority sports based on past success and something they call ‘high winning potential’. This sounds exactly like the License Raj policy that destroyed India’s economic growth for five decades. Allowing bureaucrats and politicians to pick winners and losers did not work for our economy and will certainly not get India to 50 medals by 2024. If anything, it assures political meddling since prioritized sports will likely get higher funds. For example, Haryana, which produces a high number of wrestlers, will unquestionably want wrestling to be a priority sport. Thankfully, this bizarre concept of ‘priority sports’ did not exist when Milkha Singh and P.T.Usha were competing for India because 400 meters would never have been a priority sport based on past success. Nor would we have had a Dipa Karmakar, the Indian gymnast who almost medaled at the 2016 Olympics, because gymnastics has little history in India and would not likely be prioritized. It has always been the success of an elite athlete that increases participation in a sport and it is best to leave the government out of the business of picking winners and losers in sports. It was the success of Mark Spitz that provided the impetus for the next generation of U.S. swimmers like Michael Phelps and not some wacky government prioritization scheme. Likewise, Usain Bolt’s success has ignited more athletic interest in Jamaica than any government scheme. Let natural talent decide which sports India medals in, not some bureaucrat or politician. The next set of recommendations from the First Play plan is about as unremarkable and unimaginative as they come. For example, they recommend organizing sportspersons into three groups A, B, & C, ostensibly for the purpose of determining the amount of governmental support that would go to each group. Then they recommend strengthening the existing institutional structure for identifying sportspersons and giving them the requisite training through sport training centers. The Niti brain trust then goes on to recommend that a well defined and transparent selection criteria be put in place to select and evaluate coaches. Really ! Talk about transformational and out-of-the-box thinking. One has to assume that with more than seventy years of sports history these things were already being done by some government agency. Let’s be clear: grouping athletes into three groups is not going to suddenly jump the medal count from 2 to 50 in eight years. The next great Niti recommendation to get us to 50 medals in 8 years is grading the performance of coaches using qualitative and quantitative assessment. One has to wonder how many man hours were spent at Niti Ayog in determining something that is best left to the market. Gopichand Pullela does not need a qualitative and quantitative assessment to show he is a great Badminton coach–he has a track record of producing winners. The fact that most of India’s top badminton players go to his academy suggests that he is a good coach. We certainly don’t need a government committee using quirky qualitative and quantitative tools to tell us that. Of course, I am sure the Niti bureaucrats stuck the ‘qualitative’ part in there to ensure that they and the politicians continue to have the final say in the selection of coaches. The other enlightened recommendations in the First Play plan include things like a sports Injury insurance scheme ( most top athletes likely have their own insurance plan anyway), ensuring transparency and integrity at existing training centers ( good luck with this), creation of more sports academies ( why didn’t they think of this earlier ), creation of a digital library for sports ( really, I am not making this up), starting a health and psychological support division ( another government agency and more bureaucracy), and the implementation of a National sports code and sports bill (I told you, the bureaucrats must get a bill in there to solve the problem). And then to go from bad to the ridiculous the Niti Ayog’s plan proposes a PPP ( public private partnership ) model to build sports infrastructure facilities. So essentially the Niti plan envisages that private companies can somehow be incentivised to build sports infrastructure, and have the government manage the process, the priorities, and the athletes that use these facilities. Well, it is clear that they have it completely backward. The government should be the one building the facilities, and leaving the management of athletes including their training, coaching, nutrition etc. to private companies. Even in a highly socialist country like Norway elite private sports schools are now involved in the development of world-class athletes, and not the government. In Finland, also a socialist country with heavy government involvement in most aspects of life, private sports clubs manage all the sports activities at the school level, and today more than ninety percent of all children and youth participate in voluntary sports activities arranged by these private sports clubs. There are two levels of sports activities in a country, recreational and professional sports. Government intervention at the recreational level may be desirable based on the social and health goals that the government has identified. These include school-based programs, promotion of sports activities in rural areas etc. But if India is to develop world class athletes capable of some day winning 50 Olympic medals the government has to step back, and let a private sports industry, consisting of schools, academies, sports management groups, equipment manufacturers etc., take over the responsibility of developing world class athletes. Every one of our world-class athletes–Leander Paez, Sania Mirza in Tennis; Sania Nehwal, P.V.Sindhu in Badminton; Jeev Milkha Singh, Anirban Lahiri in Golf–got there NOT because of some grand government plan, but because their careers were managed and supported by private companies. A good model for us to follow is the USA, a country which has dominated world athletics with over 2500 Olympic medals over the last hundred years, and a country in which there is zero involvement of the government in sports. The United States Olympic Committee is a nonprofit corporation which does not receive any financial support from the government. Everything is privately funded, but more importantly, also privately managed. The country does not have a Ministry of Sports, so one has to ask the question that with no government funding of its Olympic efforts, how has the U.S. performed better than everybody else over the last ten decades? The answer is very simple. It is the freedom to pursue one’s own dreams and the monetary rewards that follow from winning that has led to an explosion of talent in U.S. sports. Let’s mimic this successful model in India. We know from our own experience that privatization works. Our economy was unshackled from government controls in the 1990’s and per capita personal income has grown five fold since. Let’s do the same for sports and our medal tally will grow tenfold as a result. Let private sports companies develop business models to find, train and support the best athletic talent. A market-based process which creates the right incentives for private companies to unearth the best talent, to provide them with the best in facilities and coaching, and to create world class athletes, should be the bedrock of our sports policy. To win 50 Olympic medals we need to make sports a business. Athletes, from beginners through to high-performance amateurs or professionals, represent the basis of the sports industry. They are the engine of the sports economy. They create demand for coaches and trainers, they are consumers of manufactured sporting goods, and they use the sporting facilities. High-performance athletes attract people to the stadium for amateur or professional sporting events and their performances are broadcast on TV. The economic activity related to the sport and recreational service industries also has a broad impact on the economy. Thousands of jobs related directly to sporting activity will be created by new companies engaged in the discovery, management, training of athletes, and manufacturing of sporting, athletic and recreation equipment. The world of professional sports operates entirely in the private domain. Whether it is professional basketball in the form of the NBA, or global soccer clubs like Manchester United, Real Madrid, Chelsea–every one of them is privately owned or has shares traded on a stock exchange. That is the direction we should be heading in India. Some of it is already happening with private clubs in Cricket, Soccer, Tennis, Badminton and now even Kabaddi. Left on their own these sports have found a way to monetize themselves, and the success of a sport like Kabaddi is a testimony to the power of private enterprise and the free market. And in all this, the government can play a minimal yet constructive role by designing appropriate intellectual property regulation to protect brands, symbols, emblems, event names, broadcasting rights, techniques, designs, data, etc. Private sports clubs and schools, similar to the ones in Norway and Finland, must be encouraged. Private sports management companies armed with the best functional movement and muscle testing equipment could identify potential athletes from a very early age. One of the world’s largest sports management company, IMG, has designed a systematic approach that tests athletes to assess their performance levels using sport specific standardized tests. There are even some new, but unproven, genetic tests which have the ability to show the disposition of a person towards a particular sport. All of this science is now coming into the sports business and private capital would jump at the opportunity to deploy it in a huge market like India. Eventually what will make India a successful sporting country is not more government involvement but creating the right incentives for the athletes. And these incentives are best created by a free market which is unencumbered by government control. Sponsorship, for example, is a form of survival for most athletes. It can cover the cost of living and training for athletes in several different forms including private, corporate, and team ownership. Private sports management companies could be invited to invest in the development of our athletes. These companies are in the business of finding talent, paying for their training, finding the best trainers, coaches and performance psychologists, and eventually benefiting themselves and the athletes they represent by maximizing their sponsorship value. Michael Phelps has won more medals in the last four Olympics than India has in over seventy years, yet he has never received a penny from the US government; sponsorship pays for his living and training. In the 2016 budget, the government of India allocated almost Rs. 1600 crores for sports. Yet, for all the money spent, we have very little to show for. That’s primarily because we let bureaucrats and politicians run our sports. The Niti Ayog plan is just more of the same thing, more government involvement, more bills, more government agencies. But, doing the same thing and expecting a different result is lunacy. We need to transform the way we think about sports. Let’s think of sports as an industry with its sports schools, sports clubs, private coaching academies, sports management companies, equipment manufacturers, professional leagues, TV rights, sponsorships etc. Let’s abolish the Sports Ministry, eliminate all regulatory barriers to entry, and invite the top sports management companies to find, adopt, train, support, and convert our athletes into world class medal winners. The only way to get to 50 medals by 2024 is to get the government out of the business of managing sports. Otherwise, like Niti Ayog, we can all dream on.